A resource of Biophilia: Pittsburgh, #bi oPGH is a weekly blog and social media series that aims to encourage both children and adults to reconnect with nature and enjoy what each of our distinctive seasons has to offer. On a snowy walk through Southside Park this past weekend, the outdoors felt like a winter wonderland! Sparkling snow blanketed everything around us, and the sound of chattering birds broke through the quiet of the white, wooded world. One color popped out from snowy scene though—the vibrant orange-red berries growing among the tangled vines that wrapped around branches and thickets. Though its stark contrast against the white snow was quite pretty, the vine was actually Asiatic bittersweet (Celastrus orbiculatus, also called Oriental bittersweet), an invasive plant originally native to Japan and the Korean peninsula. Let’s take a closer look, shall we? Asiatic bittersweet was first documented in the US as an ornamental back in the 1880’s when it appeared in a nursery catalogue, but it quickly escaped cultivation and flourished in the Eastern US. 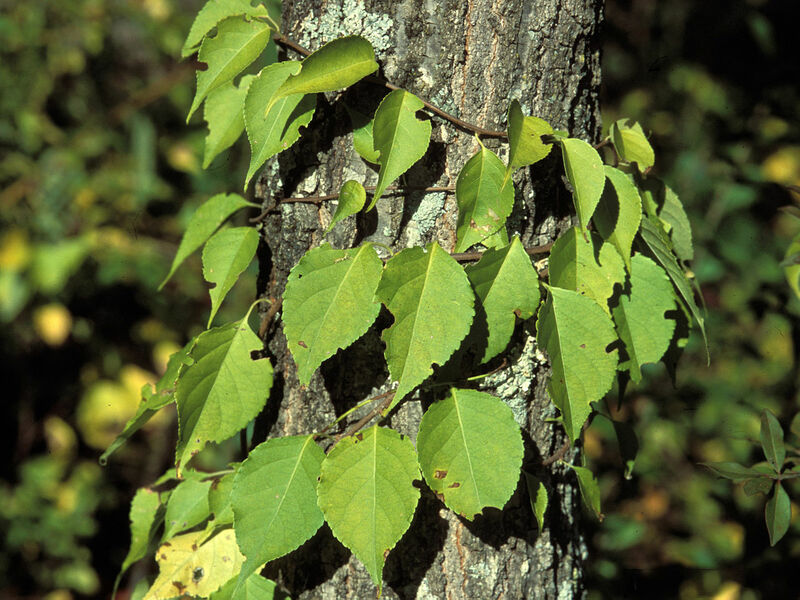 A woody vine, Asiatic bittersweet can grow to be sixty feet long and three to four inches in diameter at its thickest. The vines grow quickly, but the trouble is they wrap around other plants around them, which can eventually either pull the other plant down all together or at least block resources like sunlight or water. Asiatic bittersweet can survive a variety of conditions, from steep, rocky habitat with poor soil quality to disturbed land, like what you might find at the edge of development projects or roadsides. Intriguingly, Asiatic bittersweet thrives in full sun, but in shaded conditions, it has the unusual ability to “forage” for light by strategically growing its vine or leaves to find more sun. This adaptation may be a one way that Asiatic bittersweet outcompetes our own American bittersweet, which seems to lack this growth response. In low light conditions, American bittersweet stops directing resources to leaves or any growth when in shaded conditions. This survival strategy can prolong survival until favorable conditions return. However, Asiatic bittersweet’s persistent, light-seeking trait is probably why this vine can even invade mature forests—an uncommon ability for our vines since mature forests have such low light available below the tree canopy. If you have Asiatic bittersweet on your property, removing it will be a multi-step effort. Since new shoots can grow up from remaining bits of the root system, it will be important not only to remove that aboveground tangle of vines, but also find the roots. The USDA suggests a combination of methods that include chemical control and manually pulling down the vines and disturbing the roots. You can also call our Ask Dr. Phipps line to talk to one of our master gardeners who can walk you through available options. Sometimes, we have more of an impact on outdoor world than we realize, but by respectfully enjoying nature (leave no trace of your visit!) and conscientiously gardening by choosing native and sustainable plants, we can have a tremendous positive impact! Young Asiatic bittersweet vine growing around a tree. Photo credit USDA. Connecting to the Outdoors Tip: The next time you’re on a winter walk, keep an eye out for a vine with bright orange-red fruits. It is most likely Asiatic bittersweet, particularly if each little stem grows fruits from the ends of the stem all the way to the base of the branch. However, if the berries are only at the very ends of the stem, it might actually be American bittersweet! Check out this USGS guide to differentiate.